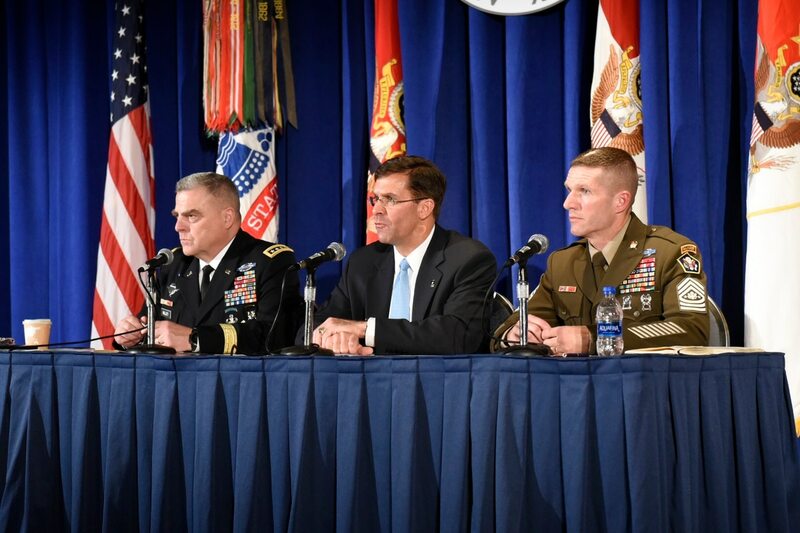 Army senior leaders were pressed on their plans to hold moving companies accountable for bad permanent change of station moves, during a town hall with military spouses Tuesday. “This year has been what many have called the worst moving season of all time, due to the gross negligence of moving companies,” said Megan Harless, an Army spouse at Fort Eustis, Virginia. “What is the Army’s plan to hold these companies accountable in order to keep the moving season from being a financial burden for military families? During the family forum town hall at the Association of the United States Army’s annual meeting Tuesday, she also asked whether there will be transparency for military families to be able to see the repercussions for those moving companies. After seeing her military friends’ stories about moving on Facebook, Harless, a former Army captain, started a petition on Change.org in August calling for the government to hold moving companies accountable for damage to military families’ household goods. As of Oct. 9, there were 102,000 signatures. Secretary of the Army Mark Esper said he’s had discussions with Secretary of the Navy Richard Spencer; the three service secretaries plan to meet regarding the issue. One idea that’s been brought up is to move single service members at times during the year other than the peak moving season, he said. About 40 percent of military moves are made in the summer, Esper said. Esper said officials may look at the possibility of posting a report on the Army website that lists which moving companies have been given a warning letter or suspended. He also said the Army staff is researching options for slowing down PCS moves. That report is due in about a month, he said. “We’ve exceeded the capacity of our civilian counterparts to do moving for our soldiers. It’s not just an Army problem, it’s a Defense Department problem,” said Sergeant Major of the Army Dan Dailey. U.S. Transportation Command, which is the executive agency for military household goods moves, “is working hard to be able to remedy that problem. Some of this is an industry problem, but it’s going to take some time and effort because of the amount of load we place on them during the peak summer periods,” Dailey said. That puts a strain on the moving industry. Military moves compete with corporate moves, which are also concentrated in the summer, and this year has seen a critical shortage of truck drivers. The upturned economy has also resulted in a shortage of labor for packing and loading crews. For its part, the Army is working to get more personnel at installation transportation offices to come and do site visits during the move, to help families through the process, Dailey said. This is also an effort TRANSCOM has discussed, to improve quality assurance. He said he knows TRANSCOM is working on a fix to the problem, going forward. Harless, who asked the question, said in an interview that she posted an open letter and started the petition after seeing comments from her friends who moved this summer on Facebook. Her family didn’t move this summer. “I never expected it to become what it has. I feel a duty and responsibility to make sure that something does happen, that change is brought about to make this experience better for military families. It’s something that every military family experiences at one time or another," Harless said.